As someone who gets hit all the time with the "HEY I COME HERE FOR GAMES NOT POLITICS SO KEEP THAT TO YOURSELF," comments, I'm going to straight-up be a hypocrite and say to Xbox Live that, hey, I come here for games and not politics and so keep all this presidential election coverage off my dashboard, OK? It's like the inverse of a with-it parent. You're trying to be current by inviting people to watch something that, when it's not unpleasant, is quite boring. Really, leave this attempt at broader relevancy to, I don't know, Newsweek. Well, evidently not enough of us are tuning in to campaign coverage on Xbox Live, so Microsoft has decided to bribe everyone. 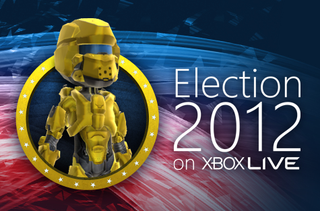 If you watch three of the four debates—one of them is the vice presidential debate—you get a free suit of Halo armor for your Xbox Live avatar. It doesn't specify how long you must watch this kind of paint dry, so I don't know. Maybe you can just show up, sign the attendance sheet, pretend you have to take a dump and then slip out the back door. But if you stay for the whole thing, you can participate in some kind of live polling, so that way we know where Mitt Romney and President Obama stand in the all-important demographic of avatars with death's head makeup, Vault 101 suits and Gears of War lancers.